If you are affected by tinnitus, you may hear “ringing” in your ears. You may also hear whistling sounds, clicking, or hissing. This type of condition, which can be treated with essential oils, can be temporary or recurring and chronic. Tinnitus itself is not a disease but is a symptom that often emerges from an underlying health issue. If you are suffering from the condition, you can treat it with certain essential oils (EOs) and gain some much-needed relief. Tinnitus is an internal sound that can either be continuous or occur intermittently. It can occur in one or both of the ears and can either be of a low or high pitch. Some of the sounds described by patients include whistling, clicking, chirping, hissing, static, screeching, buzzing, pulsing, whooshing, or roaring. Some even report that the sound is musical nature too. The volume of the sound caused by tinnitus can vary. The sound is frequently experienced at night or when a place is extremely quiet. Hearing loss may be involved when a person suffers from this problem. Tinnitus normally results from an over-exposure to cumulative and loud noises. Neck and head injuries can also lead to a “ringing” in the ears. People who have experienced ear infections frequently complain of tinnitus too. Most problems with tinnitus are due to damage to the inner ear or the cochlea. Certain medicines may worsen the sounds made by tinnitus. One example of a medication is aspirin. Patients with tinnitus should be careful about consuming high doses of the medicine. A person who experience tinnitus may be ultra-sensitive to loud sounds. No cure has been found for tinnitus, although there are methods for managing it. While most individuals with chronic tinnitus adapt to the ringing over a period, one in five people will find it debilitating or distracting. Tinnitus can trigger problems with insomnia or difficulties concentrating. The condition also can lead to anxiety, depression, or irritation. People with tinnitus may experience poor academic or work performance. When tinnitus is diagnosed, people often get treatment for the underlying cause of the condition. This treatment may include treating an ear infection or discontinuing certain medicines. Tinnitus can be relieved, in some cases, by treating temporomandibular joint (TMJ) disorders. These disorder affects the joint located between the cheek bones and the jaw bone. Some of the treatments for tinnitus involve treating the effects, or the anxiety, insomnia, or depression. When these conditions are addressed, it can improve the patient’s quality of life. Home remedies for tinnitus include sound therapy, such as the introduction of white noise or background music. Some masking devices provide temporary relief. Hearing aids may be used for sound therapy, as they increase the surrounding sounds and redirect the patient’s attention away from the ringing. Circulation is improved of both the blood and air through the body. Congestion is decreased in the respiratory tract. This is especially true in the Eustachian tube which is linked to the middle part of the ear. Ear pain and discomfort are relieved because of the essential oils’ analgesic properties. Depression and stress are reduced. This essential oil is especially favored by people who experience a pulsing type of tinnitus. This type of tinnitus is often triggered by circulation difficulties. Cypress oil is used as it increases the blood flow while calming the nervous system. The oil, which is derived from the cypress oil, can be used for a number of ailments, besides tinnitus. The oil encourages blood flow because of it hemostatic properties. The oil is used to treat and heal wounds as well as treat acne, muscle pulls, and carpal tunnel syndrome. Congestion can be treated with cypress oil as well. This oil is often used by people who suffer from tinnitus. Helichrysum essential oil is derived from a plant that is part of the sunflower family. It originates from the Mediterranean region. Its anti-inflammatory and blood circulating properties aids in draining additional fluids and relieving tinnitus sounds. Referred to as an anti-aging essential oil, Helichrysum can be added with Epsom salt in a bath to promote skin health. Using this mixture in a bath can also calm the symptoms of tinnitus. This oil is known for its ability to detoxify and cleanse the blood. When it is used to relieve tinnitus, it helps rid the body of harmful toxins. Used for its sedative and calming properties, lavender oil is often considered the ideal natural cure for stress. It reduces the tension and anxiety associated with tinnitus. A number of studies have revealed that inhaling lavender essential oil is very effective against stress and anxiety while the same studies have indicated that it is very well-tolerated. (2) (3) Either inhale your lavender oil directly or via a diffuser. You could also add a few drops to your pillows and bed sheet at night. While you may think that this oil is the ideal addition to a salad, it can be used to for tinnitus too. Basil essential oil is an anti-spasmodic. The same oil can be used to promote a healthier complexion, relieve itching, or improve the digestion. Stress management is important for people suffering from tinnitus. One of the best natural ways of dealing with feelings of stress and anxiety is by using essential oils. As well as lavender oil, a number of other essential oils are known to help relieve stress and anxiety. These include chamomile essential oil, bergamot essential oil, vetiver essential oil and ylang ylang essential oil. Usually, most essential oil combinations are used with a clean cotton ball or soft cloth and applied to the rim of each ear and behind the ears as well. Topical treatments make it possible for you to treat the condition directly. If you want to reduce the stress and anxiety that comes with tinnitus, you should inhale essential oils for relief. Combine ¼ cup almond oil with 5 drops of Helichrysum, 15 drops of lavender oil, and 15 drops of cypress oil. Place the combination of ingredients into an amber glass dropper bottle. Shake the oils in order to mix. To use the oils, place about three drops of the mix on a soft cloth and rub the blend on the rims of the ears, behind the ears, and along the ear lobes, and sides of the temples and necks. Allow the mixture to sit for about 20 minutes before dabbing the oils with a paper towel. To use a cotton ball for application, include 1 drop of any of the aforementioned oils with ¼ teaspoon olive oil. Add a drop of an essential oil to the cotton ball along with the olive oil. Let the oils absorb into the cotton, making sure that the oils are not dripping. You do not want the oils to go into your ear, as this can prevent healing. The vapors of the oils are used to promote healing and health. When using this method, insert the cotton ball lightly into the ear lobe. Never push the cotton inside the ear canal. Maintain it in this position overnight. To vaporize an essential oil or oils, you need to gather two cups of water, a drop of cypress oil, a drop of lavender oil, and a towel. Boil the water until it is vaporized. Carefully remove the pan from the heat, and place the pan on a mat on a table. Create a tent over the pan with your towel to trap the vapor. Allow the essential oil-infused vapor to absorb into the ears. If only one ear needs treatment, allow the steam to penetrate in that ear. Perform this application once each day. If you have a diffuser machine, then adding a few drops of an oil like lavender can help relieve your anxiety and stress. Simply add some of your chosen oil to a diffuser machine and inhale its soothing vapors through the day and night. Many essential oils can have a very beneficial effect on mood and can reduce the stress and anxiety that often makes tinnitus even worse. It is always a good idea to use a carrier oil with essential oils to relieve tinnitus. Doing so will prevent irritation. Some of the best carrier oils to use include olive oil or sweet almond oil but there are many more to choose from. It is important to use a suitable carrier oil because essential oils are so powerful when they are applied undiluted. These oils will neutralize the harsh effects of certain essential oils that you are using, so they are safe to use. Many essential oils have potent anti-inflammatory actions which helps soothe inflammation in the ears and the tissues. Many essential oils also have decongestant effects helping people to breathe more comfortably. By using certain essential oils, you can clear the toxins from passage that links the middle ear with your respiratory system. Essential oils can help boost the circulation of blood and oxygen around the body which along with their anti-inflammatory nature can help relieve pain. A number of essential oils are considered to be useful for treating other ear issues like earache and ear infection. Many essential oils also have mild analgesic properties that help relieve pain. A number of people suffering from tinnitus also have problems with anxiety, stress and depression. Stress can also make tinnitus worse for many people. Studies have found that a number of essential oils can reduce feelings of stress while some also have a natural anti-depressant effect. Unlike prescription anti-anxiety and anti-depressant medications, essential oils are unlikely to cause many severe side effects nor do they cause a dependence. Unfortunately for those of you who suffer from this condition, there is no proven cure. Treatment is based on avoiding certain triggers that can make the condition worse and also helping you to cope better with the symptoms. What is the most effective conventional treatment for tinnitus? While there are no cures and there are no treatments guaranteed to have an effect, some people have been helped by taking a low dose of anti-anxiety medications like valium. Antidepressants including Elavil may also help reduce a person;s tinnitus when taken in low doses. Another potential treatment is a steroid which is applied in the middle ear and used along with an anxiety medication called alprazolam. Some people have found this treament to be effective but certainly not all. Speak to your doctor about the best options for you. Avoid any potential irritants that may cause the tinnitus to become worse. Manage your stress since stress can make the condition worse. Cover up the ringing noise caused by tinnitus. Soft music or a gentle, whirring fan might mask the noises you experience from the condition. Reduce your consumption of alcohol and caffeine since they can make tinnitus worse. Tinnitus is most commonly caused by damage to or loss of the sensory hair cells found in the inner ear’s cochlea. This can happen more often as people get older but can also be caused by a prolonged exposure to loud noises. Ear infections may also result in tinnitus. While there is no direct cure for tinnitus, you can gain relief by using essential oils for treating the condition. Tinnitus is often thought as a symptom of an underlying condition. It is brought on by over-exposure to loud sounds or from ear infections or injuries to the neck or head. 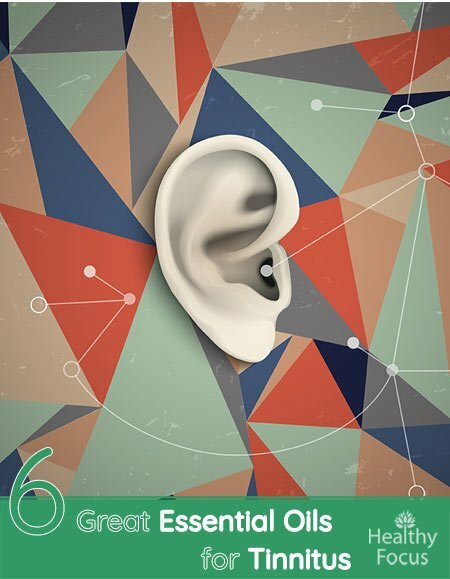 When using essential oils for treatment, use the oils around the ear, and make sure that you do not apply them directly inside the ear. The idea of treating the condition with the oils is to use the vapors to gain relief. The vapors penetrate the ear and provide their healing effects. People with tinnitus can also gain relief by treating some of the effects that are brought on by the condition. For example, people may undergo counseling for depression, anxiety, or stress. This form of treatment includes coping strategies and further education about the ailment. Experts suggest that anyone with severe tinnitus learn more about the condition and how to deal with the symptoms. This primarily includes learning more about biofeedback and finding out ways to cope with the sounds. Patients often benefit as well by joining a support group. Some people may get involved in an activity, known as tinnitus retraining. This entails wearing a device inside the ear that provides white noise or soothing music. By taking this approach, a tinnitus sufferer can become used to the noise. Masking devices or hearing aids are also used to bring about the same outcome. It also helps to avoid extremely loud noises, if at all possible.